I'll try to do these kind of updates every few weeks....there's a lot going on, so prepare for an overload of information, but it's all good stuff. Our first 4 games are John Marshall at home, at Triway, then Northwest & Lexington at home....we have a real opportunity to get off to a hot start and you never know how the season will go if that happens. We've seen what confidence (and yes, swagger) can do to a team. If this team gets off to a good start and sees the results of their hard work paying off in wins, it could be a very interesting season. I'm certainly not saying I predicted 3-0, but I certainly was saying that is was possible...very possible in fact. I think the first 3 weeks have great for everyone's psyche, but especially the 40+ kids on the roster. They're buying in, they're seeing results due to effort and they're seeing that the coaches are doing their best to put them in the best position possible to win. 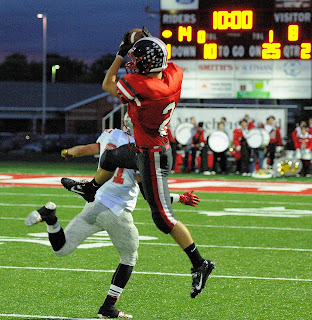 Last week's 28-22 win over Northwest was a gutsy effort. The game seemed to be slipping away from us in the 3rd quarter but the kids refused to quit and found a way to win. It's nice hearing how this team seems to get along...from seniors to freshmen, and that's a very big thing. The only potential downside is that we're only 3 weeks into the season, and about to embark on another 7-week grinder of an Ohio Cardinal Conference schedule. Again, health will be so key. I think this team has it in them to compete each and every week and may spring a few upsets on the way to a week 10 showdown with Wooster that very well may have playoff implications....yes I said playoffs. But lets stick to 1 week at a time....4-0 heading into a very tough stretch of games would be the very best possible outcome. If Coach Davault and his staff take this program from 1-9 a year ago to the playoffs this year, he deserves serious recognition for coach of the year honors. You have to give him credit for going back to the drawing board after last year and installing a lot of new plays and formations. It's worked so far and he's called all the right shots with putting kids in the right spots. We'd be only the 5th northeast Ohio public school (joining McKinley, Massillon, Mogadore and Warren Harding) as 600 win programs. That's quite a class of schools. In the first AP State Football Poll, the Riders checked in a #10 in Division 5 and even earned a first place vote from someone. I'd guess the last time we cracked the top 10 was in 2011, but that's just a guess. Take AP polls with a grain of salt though. The computer polls are what matter in terms of the playoffs, and as of right now the Riders are on top of Region 16. The volleyball team is also ranked in the latest Ohio High School Volleyball Coaches Association poll, at #16 in Division 3. Again, take with a grain of salt, but I think that's a little low for a team coming off a Final 4 appearance and a team that's playing in a very tough volleyball conference. The Red Rider volleyball team is on quite a roll, winning the inaugural 8-team Orrville Invite this past Saturday, defeating Hoover in the championship game and then rolling over Wooster tonight in 3 games. They are currently tied atop the OCC standings with Madison. Special congrats to senior golfer Layne Scheufler on carding his 3rd hole-in-one in his high school career. I'm still waiting on my first, and he's sunk 3 just while in high school!! This article says the odds of a hole-in-one are 12,500 to 1....so he's defied those odds 3 times. This Friday's game versus Lexington will be broadcast on 104.5 WQKT and I think it's the first game they've done at our stadium since the Wooster game in 2011. Nice to have the best radio crew in the state back to Red Rider Stadium. Congrats to the soccer team for their big 3-2 win over West Holmes to clinch their first conference win on the season. Keep working hard!! Please consider purchasing raffle tickets for the 2014 Chevy Cruze that was kindly donated by Serpentini Chevrolet. Tickets are $10 each or 6 for $50. The Booster Club keeps every dime of ticket sales money to benefit ALL OHS sports teams. Would love to see a much bigger crowd this Friday for the Lexington game. Last week's crowd was ok, but we can certainly do better. These kids are working their tails off to get Red Rider football back on the map and deserve our support in the process. Weather is supposed to be nice on Friday, so there's really no excuse. Will the game on the radio be available to stream online?